Hot. That was the word of the day. Damn hot. Ridiculously hot. Why are we here hot. We got a decently early start, but it was already 92 degrees. It was that cool for about 10 minutes, then jumped into the 100s just on the outskirts of the city and stayed there all day. So, knowing that it was super-hot, we didn’t really see any interesting sites in our research, and route 66 isn’t so clearly marked in western Oklahoma, we decided just to make the miles today. Blasting along at 70mph on the highway isn’t my idea of a great time, but it did minimize the time we were baking out there. We could see the route 66 along the side of the highway so I don’t really feel we missed much. We did find 2 interesting sites in Texas, however. We stopped in Shamrock, TX, at the U Drop Inn. 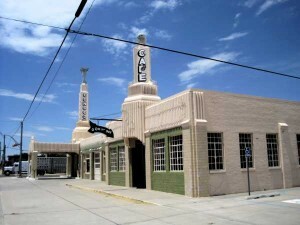 It’s a really neat art,deco gas station and cafe that was the inspiration for Ramones in the movie “Cars”. I should have taken more pictures but it was just too hot! 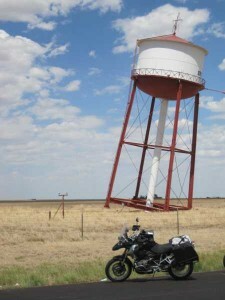 The second site was the water tower in Groom,TX. It’s the leaning tower of Texas I guess. It’s neat to see it off in the distance, even if you know it was made that way on purpose. We stopped on the side of the exit ramp long enough for me to jump off the bike, walk across the road, snap a couple of pictures and jump back on the bike. We stopped for a quick drink at the Dairy Queen in Groom, then made the last 45 minute ride to our overnight stop in Amarillo.